To the west of the Mursi, across the Omo River, live two groups of agro-pastoralists called Tirmaga and Chai, who are together called ‘Suri’. This is their self-name in the context of ethnic relations in Southwest Ethiopia and South Sudan. A third group, speaking a somewhat different language, are the Baale (or ‘Balesi’, or ‘Kachipo’), who also live partly in the Republic of South Sudan and move regularly across the border, following interests dictated by trade, intermarriage, or the occasional search for better pastures in the dry season. There are some 34,000 Suri in the Southwest of Ethiopia. The two Suri groups have a somewhat different internal composition and descent system, with the Tirmaga tracing more links with the highland Dizi (called ‘Su’), and the Chai, the larger group, having more of a Sudan connection and also being much closer to the Mursi with whom they intermarry and share agricultural areas near the Omo. The Kibish River runs across Suri territory from north to south, ending in Nyangatom territory, towards Lake Turkana. The Suri area was conquered by imperial Ethiopian troops in 1897. The region was then formally incorporated into Ethiopia, and was the frequent target of cattle raids by highlanders and imperial troops based in the newly established villages (katamas). The social and cultural similarity of Suri with the Mursi and to a lesser extent with the Didinga and Larim in South Sudan is notable, and can be recognized in a similar kinship organization, in birth, marriage and funeral customs, in a patrilineal clan structure and in age grades and initiation rites for age-sets. All Suri groups together with the Mursi have a similar age-set structure, and initiations into a new set ideally occur every 20 years in a series from west to east, i.e., first the Baale and last the Mursi. This sequence was, however, disturbed in 1991, a time of upheaval. The late Bolegid'angi was a Tirmaga komoru in the 1990s. Their society, while now more integrated into national Ethiopian structures of administration and more under the control of the state, previously had a fairly autonomous political structure, headed by the elders of the reigning age-grade as well as a few ritual chiefs or ‘priests’, called komoru, as among the Mursi. The Suri have a traditional belief system with a supreme sky deity called Tumu. The komoru is a mediator between humans and Tumu, acting as a contact point with the sky god that brings rain and fertility. But Suri have no public religious services of any kind dedictaed to Tumu. Ancestors of clan-lines are also recognized as having powers and as influencing the health and destiny of living people. In the past 15 years, Evangelical Christianity has gained adherents among the Suri (some 200-300), notably among those in the town of Kibish and those that left the area to study. 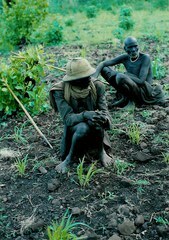 The Suri have lived in the Ethio-Sudan border area for many generations, successfully surviving through a combination of livetsock hearding (cattle, goats and sheep), some hunting and gathering, rain-fed cultivation of a variety of field crops like millet, corn, and sorghum, and the garden cultivation of legumes, spice plants, peas and beans. Migration has been restricted due to armed conflict, state pressure and some very serious droughts which have led to food shortages and even famines in the past few decades. Since the late 1980s the Suri have also gained cash income from the sale of alluvial gold to highland traders in nearby villages. During the last five to seven years, this trade has suffered from strong competition from highlanders and army–related people, who have tended to push the Syuri out of business. The post-1991 ‘ethnic–federal’ Ethiopian regime has formally accorded the Suri political autonomy in a separate ‘woreda’ (district) but the leadership of this district is carefully groomed and controlled by the authorities. The state does not really consult the Suri community leaders on any matter and has appointed its own advisors. Specially trained Suri youths were appointed as new leaders. There is a Suri (Chai) member of parliament and also one Baale member, but they have hardly any influence. The Suri are a very interesting and tough people, who have had their share of problems with neighbouring peoples, like the Nyangatom (‘Bume’), the Anywa (Anuak), and the Dizi (an Omotic-speaking group of cultivators in the highlands around Maji, Tum and Jeba towns) who are closer to the government. Tensions also existed with the Toposa in South Sudan, allies of the Nyangatom, who frequently raided their cattle. There have also been violent clashes with the Tishana Me’en. Most problems in recent decades, however, have been with the authorities. The village highlanders, of mixed descent, tend to look down upon the Suri ‘nomads’. There is a dramatic history of conflicts and clashes of Suri with highlanders and national government officials, who have a deep distrust of the Suri and saw them always as uncivilized lowlanders ‘without religion’. This started under the Derg regime (1974-1991). Since about 1994 the Ethiopian state has stationed a military contingent among the Suri, allegedly for border patrol but, as it seems, primarily to intimidate the Suri. They have rarely helped the Suri in repelling the (cattle) raids of the Toposa coming from South Sudan into Ethiopia, although in 2007 a kind of truce was achieved. In recent years the consistent aim of the army has been to disarm the Suri, despite the fact that it has not guaranteed the security of the Suri vis-à-vis predations from neighbouring groups, including those from South Sudan. Beyond recognizing them as a ‘nationality’ (or behéreseb in Amharic) and giving them a nominal administration, the post-1991 Ethiopian government has done little for the Suri, apart from taking over a missionary school for primary education, building a basic health clinic and giving occasional veterinary services. Support for agro-pastoralism or agrarian activities has not been visible. The small but growing town of Kibish features as the capital of the Surma district and has some government services. New roads are being built in the area, to open it up for trade and business by highlanders and foreign investors. A large new Malaysian–owned plantation was recently built in the Koka Plains, north of the small town of Tum, using part of the Suri grazing areas which are now off-limits to them. Local people assert that the government does not recognize the right of Suri to pursue their own culture and way of life – and they point to the campaigns to prohibit ceremonial stick duelling (a kind of sport), the culture of body decorations (e.g., ochre in the hair of females, the making of incisions in the skin, and the insertion of lip and ear discs by women), and the imposed changes in their livelihood system and herding practices. Hundreds of tourists, travellers, photographers and film-makers have visited the Suri since the early 1990s and published popular articles and produced films on them. Women's lip plates and the stick duelling called thagine, a characteristic and cherished Suri institution which features prominently in their self-image, have been popular subjects of these articles and films. Suri history and society have been described by a number of scholars, among them Ethiopian medical researchers, the French author Christan Bader, Dutch ethno-historian Jon Abbink, and some others. As to language studies, the Tirmaga dialect was described by linguist Michael Bryant (1999). Some global press journalists and Ethiopian human rights reporters have written pieces on the recent problems and threats to Suri livelihoods in recent years. The Suri economy and culture is under threat from outside forces such as the new investment schemes by the Ethiopian government and some foreign companies, which lead to land confiscations, resource pressure and the pushing out of the Suri from their traditional alluvial gold panning activities. They are also more and more forbidden to move around with their livestock and a limit was even imposed on the size of their cattle herds. One aim of the land alienation since 2010 has been to concentrate Suri together into new villages and have them give up cattle herding. In a predictable move, the government wants to make them into easily controllable farmers, settled in one spot, which ignores the potential of this area for extensive livestock-keeping. This is deeply resented by the Suri as it does not make economic or social sense to them to live huddled together in villages with no amenities and no room for cattle. They see it also as humiliating; all the more so because they were not consulted on anything and feel discriminated. Many violent incidents have already occurred in the area of the plantation. The Suri feel that their rights are not respected. This is even asserted by the few Suri ‘leaders’ (spokesmen) in the regional administration in Awasa (capital of the Southern Nations, Nationalities and Peoples’ Regional State) or in the national parliament – who are members of the ruling party. The Ethiopian federal government seems to have an unimaginative ‘one-size-fits-all’ top-down approach to land use and development. The confiscation of local lands and the suppression of agro-pastoralism have endangered local systems of food security and group relations. Suri also see no attractive prospect in becoming low-paid labourers on the new foreign plantations, as this would make them dependent and marginalized. Like the other local peoples, the Suri are resilient and not against change, but cooperation in developmental ventures and better groups relations will only be favoured if overall policies of the administration – and those of ‘donor countries’ - improve substantially. Abbink, Jon 2009 Conflict and social change on the south-west Ethiopian frontier: an analysis of Suri society. Journal of Eastern African Studies 39 (1): 22-41. Abbink, Jon, Michael Bryant & Daniel Bambu 2013 Suri Orature. Cologne (Ger. ): R. Koeppe Verlag. Bader, Christian 2002 Les Guerriers Nus. Aux Confins de l’Éthiopie. Paris: Payot & Rivages. Bryant, Michael 1999 Aspects of Tirmaga Grammar . Arlington: University of Texas at Arlington (M.A. Thesis in Linguistics). Feron, Benoît 2008 Surma, Faces & Bodies. Bruxelles: La Renaissance du Livre. Yetmgeta Eyayou, Yemane Berhane & Legesse Zerihun 2004 Socio-cultural factors in decisions related to fertility in remotely located communities: The case of the Suri ethnic group. Ethiopian Journal of Health Development 18 (3): 171-174.